in my lore most dragons have some limited access to magic, but these guys are especially magical! Circe is a necromancer! She might look and sound spooky, but she uses her powers more for good, like helping ghosts find their way or rising folks so their family members can say goodbye. Hawthorn is a green witch, a witch with control over plant life and limited control on animals. She mostly just uses her magic to grow crops extra large and to keep her chickens happy and healthy. Don't make her use it for anything else. 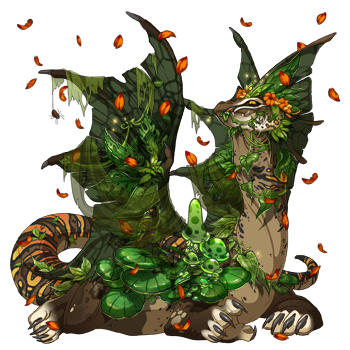 Sundew is a green witch too, but... a different kind. Creating life and accelerating growth can be a dangerous thing, depending on what gets caught up in it. Green witches must be very very careful. Sundew is not. Yonquil is a shapeshifter and can turn into any invertebrate. He started with bugs but has since moved on to jellyfish. He is now working on cephalopods. Examples of his various forms are in his bio! The only difficulty here is only sharing three dragons, since magic is quite important to my clan! 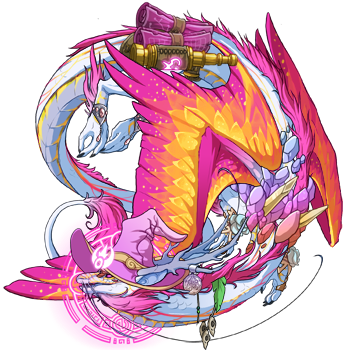 But here are my three most magical guys and gals: [url=http://flightrising.com/main.php?dragon=36250853] [img]http://flightrising.com/rendern/350/362509/36250853_350.png[/img] [/url] The first one would be Meneldur, my Shadow rep. Like his namesake, he spends his time watching the stars in a tower on my clan's island. Within the moving and dancing of the stars on the night sky, he finds not only beauty, but also truth: he attempts to understand the universe and its workings through the movements of the stars. He is also, in a way, the head mage of my clan. Through years and years of study, he has managed to become proficient at high magic. [url=http://flightrising.com/main.php?dragon=36497880] [img]http://flightrising.com/rendern/350/364979/36497880_350.png[/img] [/url] The second would be his mate, Almarian, my Arcane rep. Like Meneldur, she loves to watch the stars, even moreso by standing on the cliffs of my clan's island, staring out into the endless night and watching the reflections of the stars on the sea. As an Arcane dragon, she was surrounded by magic since she was a hatchling, and she has received a formidable education in regards to magic by high magisters residing on the Starfall Isles. [url=http://flightrising.com/main.php?dragon=34785986] [img]http://flightrising.com/rendern/350/347860/34785986_350.png[/img] [/url] The last would be Vaidurya, my Ice rep. (why are all my magic dragons flight reps smh...) Where others might look for magic in the earth, the trees, gemstones or the deep waters, he looks for it in the place where he suspects his origin: space. The other clan members are not quite sure what to think of his travel stories from outer space, but they respect him, even if not everyone believes him. His magic is a more chaotic one, and although he has a deep respect for Meneldur and Almarian, he sometimes has to smile at all the rules and guidelines they follow for their magic. The first one would be Meneldur, my Shadow rep. Like his namesake, he spends his time watching the stars in a tower on my clan's island. Within the moving and dancing of the stars on the night sky, he finds not only beauty, but also truth: he attempts to understand the universe and its workings through the movements of the stars. He is also, in a way, the head mage of my clan. Through years and years of study, he has managed to become proficient at high magic. The second would be his mate, Almarian, my Arcane rep. Like Meneldur, she loves to watch the stars, even moreso by standing on the cliffs of my clan's island, staring out into the endless night and watching the reflections of the stars on the sea. As an Arcane dragon, she was surrounded by magic since she was a hatchling, and she has received a formidable education in regards to magic by high magisters residing on the Starfall Isles. The last would be Vaidurya, my Ice rep. (why are all my magic dragons flight reps smh...) Where others might look for magic in the earth, the trees, gemstones or the deep waters, he looks for it in the place where he suspects his origin: space. The other clan members are not quite sure what to think of his travel stories from outer space, but they respect him, even if not everyone believes him. His magic is a more chaotic one, and although he has a deep respect for Meneldur and Almarian, he sometimes has to smile at all the rules and guidelines they follow for their magic. might take long to reply! familiars I'm looking for! click if you want to help out! Oooooh I have many magical dragons! Xilanta, the Clan Healer. She's the most magically talented dragon in the lair, despite knowing many dangerous spells, her preferred type of magic is Healing. Valore, the Wild Sorceress. She likes to play with the most bizarre and dangerous types of magic, pushing it's limits and not caring about the consequences. Tlireth, the Scribe. She creates spell scrolls, glyphs and runes, simple as that. Her wife also deals with magical goods, being a skillful enchanter herself. I have quite a lot of magical dragons, however most of them are skydancers. [url=http://flightrising.com/main.php?dragon=33769729] [img]http://flightrising.com/rendern/350/337698/33769729_350.png[/img] [/url] [b]Arcane[/b] His magic is caused by his skin, it is seen as both a blessing and a curse. He tries to use his powers for good but sometimes descends into a sort of trance and randomly fires spells, not knowing what he had done when he becomes sane again. 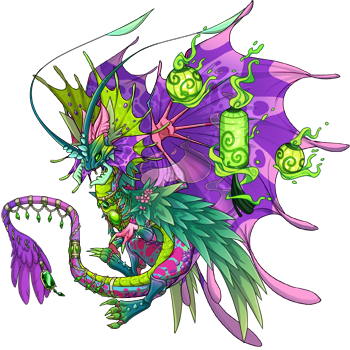 Fortunatly the clan has enchanted items to protect them from Arcane's trances, however he is the cause of a future incident that changes the whole royal family into pearlcatchers... [s]also known as when I find the funds to buy 4 pearlcatcher scrolls + multiple gene scrolls[/s] [url=http://flightrising.com/main.php?dragon=35873293] [img]http://flightrising.com/rendern/350/358733/35873293_350.png[/img] [/url] [b]Aspen[/b] [s]Coincedently also a skydancer. [/s] Aspen has a deep affininty with nature and is a skilled mage. She also has valuable knowledge of healing plants and often helps the clan healer find new cures and treatments. She is also aids the main battle team as they explore new territories (coli team). [url=http://flightrising.com/main.php?dragon=40093766] [img]http://flightrising.com/rendern/350/400938/40093766_350.png[/img] [/url] [b]Prince Ignatius[/b] [s]Finally, a pearlcatcher-to-be rather than a skydancer! [/s] One of the two princes of my clan, Ignatius prefers to stay indoors and practice magic. This means that he has more magical skill than his brother, Prince Hunter, who prefers to explore outside of clan territory. Ignatius enjoys his magic and is known to use it for petty or unnecessary reasons. I have quite a lot of magical dragons, however most of them are skydancers. Aspen has a deep affininty with nature and is a skilled mage. She also has valuable knowledge of healing plants and often helps the clan healer find new cures and treatments. She is also aids the main battle team as they explore new territories (coli team). 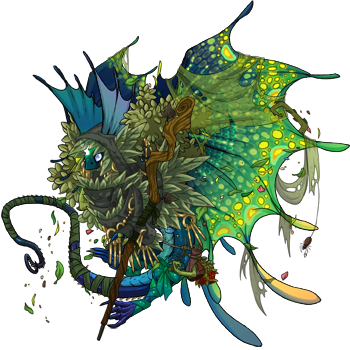 Finally, a pearlcatcher-to-be rather than a skydancer! One of the two princes of my clan, Ignatius prefers to stay indoors and practice magic. This means that he has more magical skill than his brother, Prince Hunter, who prefers to explore outside of clan territory. Ignatius enjoys his magic and is known to use it for petty or unnecessary reasons. 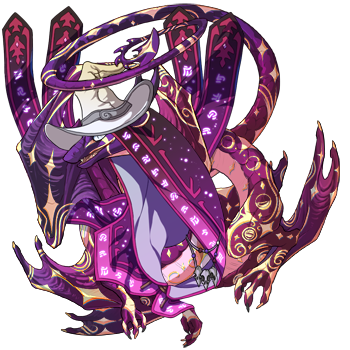 [url=http://flightrising.com/main.php?dragon=4016687] [img]http://flightrising.com/rendern/350/40167/4016687_350.png[/img] [/url] Skyrunner is my oldest dragon and she knows everything there is to know about Magic. She teaches the young dragons how to most efficiently use their elemental core in their magic performance, and has continuously studied since she found the abandoned lair so many years ago. [url=http://flightrising.com/main.php?dragon=16606354] [img]http://flightrising.com/rendern/350/166064/16606354_350.png[/img] [/url] Boone studies Magic for different purposes. He is born in the clan, but has few associates within, as most cannot speak Fae. His core is Ice Magic, but he is mostly interested in Nature, Wind and Water spells. He spends a lot of time in the wild, trying to understand the world around him. 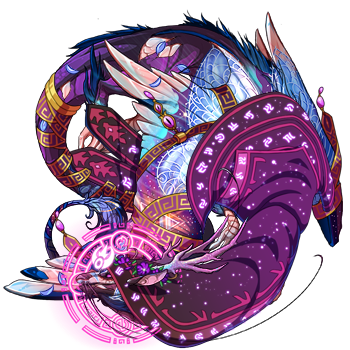 [url=http://flightrising.com/main.php?dragon=8193319] [img]http://flightrising.com/rendern/350/81934/8193319_350.png[/img] [/url] Aya is of a Wind Clan, but thrives in her home in the tundra. Aya mostly practises healing magic, and is the prime caretaker of the sick and the injured. In the early days of the Clan, there were a lot of battling over territory with the local tribes and nearby clans, and at the time her magic was urgently needed and appreciated. These days, alliances and truces have been established, but her efforts to keep her clan safe have far from been forgotten. Skyrunner is my oldest dragon and she knows everything there is to know about Magic. She teaches the young dragons how to most efficiently use their elemental core in their magic performance, and has continuously studied since she found the abandoned lair so many years ago. Boone studies Magic for different purposes. He is born in the clan, but has few associates within, as most cannot speak Fae. His core is Ice Magic, but he is mostly interested in Nature, Wind and Water spells. He spends a lot of time in the wild, trying to understand the world around him. Aya is of a Wind Clan, but thrives in her home in the tundra. Aya mostly practises healing magic, and is the prime caretaker of the sick and the injured. In the early days of the Clan, there were a lot of battling over territory with the local tribes and nearby clans, and at the time her magic was urgently needed and appreciated. These days, alliances and truces have been established, but her efforts to keep her clan safe have far from been forgotten.